Spring WebFlux introduced from Spring framework version 5.x allows us to develop Reactive Web applications. 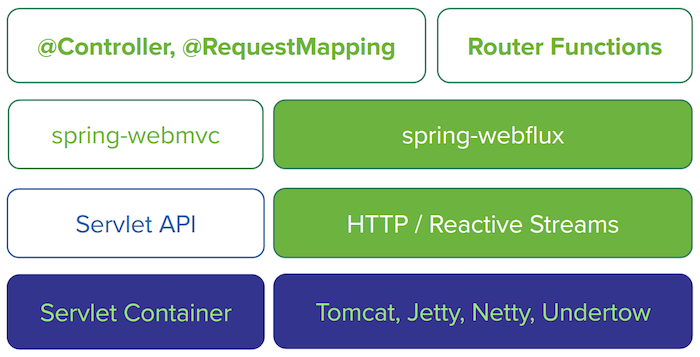 Spring WebFlux uses Project Reactor to implement Reactive Streams specification. You can find out about Project Reactor in this tutorial. In this tutorial, I would like to summarize the tutorials of Huong Dan Java about Spring WebFlux for your reference. In this tutorial, I will introduce with you all about Spring WebFux to implement Reactive web applications. In this tutorial, I will show you how to implement Reactive Web application using annotation with Spring WebFlux. To implement the Reactive Web application using Spring WebFlux, we can use Functional Programming with the HandlerFunction and RouterFunction objects. In this tutorial, I will guide you all how to consume Reactive Web Service using WebClient of Spring WebFlux.